Since early 2011, China has been testing the large multirole J-20 strike fighter/interceptor. 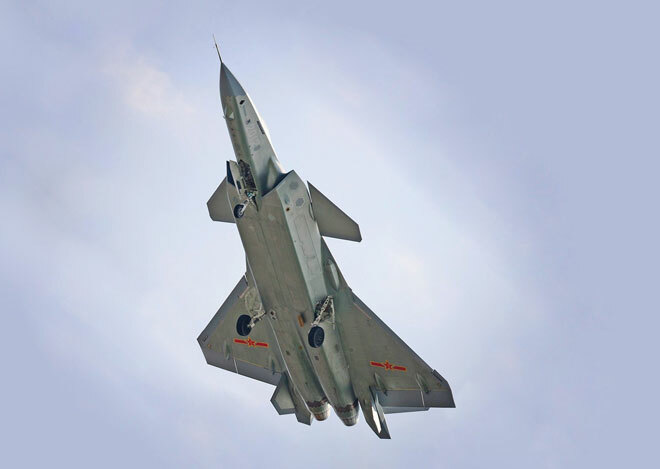 According to the 2011 Pentagon report on Chinese military power, China was attempting to introduce stealth, advanced avionics, and supercruise capability to the J-20, which would give it an increased ability “to strike regional air bases, logistical facilities, and other ground-based infrastructure,” as well as giving “the PLA Air Force a platform capable of long range, penetrating strikes into complex air defense environments.” The 2016 edition of the Pentagon report stated that the J-20 had “modern avionics and sensors that offer more timely situational awareness for operations in network-centric combat environments, radars with advanced tracking and targeting capabilities, protection against enemy electronic countermeasures, and integrated EW systems.” China’s state media have recently confirmed press reports that the J-20 is operational. Based on photographs available, the J-20 appears to be larger than the U.S. Air Force F-22, which is larger than the F-35. According to aviation journalist Piotr Butowski, the J-20 design “indicates the priority of speed and range over maneuverability.” 1 It appears optimized for a speed of Mach 1.2 to Mach 1.8. The wing area of the J-20 is about 25 percent less than the F-22 , with wing loading almost identical to the F-35. 2 Apparently, it does not have a gun. Aviation journalist Andreas Rupprecht states that its maneuverability is at least comparable to the Chinese J-11B (a Su-27/Su-33 Flanker derivative). 3 This implies it has good fourth generation maneuverability and may be more maneuverable than the F-35, which was not designed to be more maneuverable than the F-16 or the F-18. Absent a gun, an advantage in maneuverability is less important, although its ability to carry the Chinese version of the Sidewinder internally is a significant advantage in close range combat. The J-20 should have long range, particularly when its current engines are replaced. Former head of the Russian Air Force Colonel General Alexander Zelin, says its combat radius is approximately 1,250 miles. Photographs of the J-20 show it carrying four large external fuel tanks and dropping them and their pylons, giving it the potential to increase range or loiter time substantially and allowing it to reconvert to stealth mode in flight. The J-20 is reported to carry a long-range air-to-air missile that could hit aircraft at ranges up to 180 miles. A photograph shows it being carried externally, and at some point such a missile could be carried internally. The J-20 clearly represents a threat to AWACS, tanker aircraft, and fourth-generation fighters. In large numbers, it could be a threat against the F-22 and F-35. Its large bomb bays could allow it to launch air-to-ground or antiship missiles beyond the detection range of U.S. systems. Like the Russian Pak FA, the J-20 apparently lacks some attributes of a 5th generation fighter. Mikhail Pogosyan, president of Russia’s United Aircraft Corporation and Sukhoi Company, commented, “As for the development of a genuine 5th generation combat aircraft, China obviously has a long way to go.” 5 This is an apparent reference to China’s problems developing advanced engines and avionics. By comparison, the official description of the stealth level of the F-35 is that of a metal golf ball. Aviation Week reports that the F-35 RCS is -30 dBsm or .001 square meters. 9 The F-35 is reported to be stealthier than the F-22 from the front, although it is generally said to have a less uniform RCS than the F-22. If true, the F-35 probably has a one-to-two order of magnitude advantage in stealth over the J-20, giving it a first shot/kill advantage in a one-on-one confrontation. This does not consider the F-35’s networking, data fusion, and electronic warfare capabilities, which likely increase its advantage considerably. To compensate for the WS-15 problems, China is procuring the Russian Su-35 fighter to get its 117S engines, the most advanced Russian fighter engines. The sale of Su-35s to China was long delayed by Russia’s concern about Chinese reverse engineering. The Russian engine, however, reportedly will not have enough thrust to give the J-20 supercruise capability, though it will improve aerodynamic performance and provide thrust vectoring. Lockheed Martin says the F-35 has a limited supercruise capability (150 miles at Mach 1.2.) giving it an advantage over the current J-20. If the F-35 thrust is increased through engine improvements, this should increase its supercruise potential and give it an advantage even over a J-20 equipped with the Russian engines. The J-20’s sensor capabilities appear to be impressive. In addition to its active electronically scanned array (AESA) radar, the Chinese appear to have copied the stealthy electro-optical targeting system sensor housing from the F-35. The J-20 reportedly also has a 360-degree optical counterpart to the F-35s distributed aperture system. Just because it looks the same does not mean that it works the same. While the J-20’s AESA radar probably gives it enhanced detection against low RCS targets (compared to passive array or mechanically scanned radars), not all AESA radars have the same power and capabilities, including stealth, electronic protection, and electronic warfare capability. According to press reports, the F-35’s APG-81 radar operates “in LPI (low probability of intercept) and LPD (low probability of detection) modes that minimize the aircraft’s signature to comply with its low observable (LO) requirements. The radar is optimized for agility, very low noise, high efficiency, and fully supports the LO nature of the aircraft.” 11Since the J-20 radar is an early Chinese AESA, it is unlikely to be in the same class as the radar on the F-35. Moreover, it is unlikely China can match the “flying super computer” capabilities of the F-35, including sensor integration and networking to improve pilot situational awareness. In 2015, then-chief of the F-35 joint program office Lieutenant General Christopher Bogdan, U.S. Air Force, commented, “I’d put this airplane up against any airplane in the world today, tomorrow and for the next 20 or 30 years, and we will come out ahead.” The Air Force says the F-35 achieved 110 “kills” against “adversary aircraft” in Exercise Northern Lightning and achieved a 20-to-1 kill ratio in the early 2017 Red Flag exercise. Marine F-35Bs reportedly suppressed SAM sites without being targeted. Overall, the J-20 is likely to be a serious threat to U.S. aircraft, ships, and bases for the foreseeable future. While the F-35 has better stealth and sensor capability and the J-20 may not be a matchup one-on-one, the Chinese may be able to put more of them in the sky. In 2017, General Herbert Carlisle, Commander Air Combat Command, stated that in the South China Sea the threat may be “10 squadrons of J-20s, plus Su-35s…and Su-30s and J-10s and J-11s.” So, while not as good as the F-35, the J-20 does not have to be as stealthy or have sensor parity to have an impact on the Far East military balance. This article appeared originally at the U.S. Naval Institute's Proceedings Magazine. 1. Piotr Butowski, “Fighters, Bombers & Flying Boats,” Air International, December 2016, 9. 2. Dr. Dave Sloggett, “Stealth Warriors,” Jets Monthly, August 2012, 17. 3. Andreas Rupprecht, “Dragon Unleashed - J-20 Makes Public Debut at Zhuhai,” Combat Aircraft, January 2017, 5. 4. Robert Haddick, “China’s Offensive Missile Forces: Implications for the United States,” Testimony before the U.S.-China Economic and Security Review Commission, 1 April 2015. 5. “How Sukhoi President Looks at J20 Fighter,” Kanwa Asian Defense Review, no. 84 (October 2011), 34-35. 6. Nate Jaros, “Chengdu J-20, The Chinese Raptor?” Real Clear Defense, 26 September 2014, realcleardefense.com/articles/2016/09/26/chengdu_j-20_the_chinese_raptor_110124.html. 7. “Airpower Classics F-117 Nighthawk,” Air Force Magazine, September 2013, 136. 8. Rupprecht, “Dragon Unleashed,” 5. 9. David A. Fulghum, “F-22 Design Shows More Than Expected,” Aviation Week, 8 February 2009, aviationweek.com/aw/jsp_includes/articlePrint.jsp?headLine=null&storyID=news/aw020909p2.xml. 10. Bill Gertz, “Top Gun Takeover: Stolen F-35 Secrets Showing Up in China’s Stealth Fighter,” Washington Free Beacon, 13 March 2014; and Bill Sweetman, “Chinese J-20 Stealth Fighter Advances,” Defense Technology International, 31 January 2012.